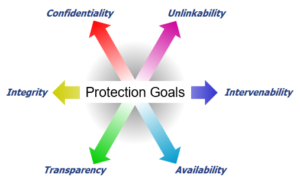 To ensure effective data protection, iKoPA follows the principle of “Data Protection by Design” and involves data protection early in the development process. German national data protection laws are analysed as well as the General Data Protection Regulation. Advice for technical and organisational measures is given based on the Standard Data Protection Model, which is recommended by the German supervisory authorities for audits and consultations. This work is complemented by a Data Protection Impact Assessment and privacy-related ethical considerations.